Grueling hours, low pay and hard conditions inside the laundries made them workplaces ripe for organization. They also made the laundries a subject of widespread public discussion. "Laundry Workers are among the hardest worked and poorest paid workers in the industrial field", wrote the Seattle Union Record in 1912. Wages were only part of why the public paid attention. They also nursed well-founded fears concerning laundry sanitation; "progressive" citizens feared the possible spread of serious health problems. They were correct, too. For in the laundries, in high temperatures with poor ventilation, soiled and sometimes infectious fabrics were continually handled and mingled. Along with goods from hotels, restaurants and rooming-houses, many commercial laundries dealt with goods from hospitals. Nor could a laundry really police the choice of goods they handled; drivers on commission frequently took up "bundles" where they could. The power laundry industry evolved its own distinct vocabulary, based around the types of services it offered - and their varied costs. A "wet wash" laundry merely washed the goods; a "dry wash" laundry washed and dried but did not iron (or "finish") them. The "soft finish" laundry dried all clothing but ironed only "flatwork" (towels, blankets, linens). "Rough dry" was a category where starch had been used but no ironing done. The "full finish" service meant each article of clothing had been starched and completely ironed. Marking (listing and sorting) such goods was the laundry's easiest job and the first stop on a bundle's odyssey. Although it was considered the highest class of laundry work, marking was also dangerous. This was not just because of possible contagion or the fact work was carried out in humid, damp premises. A marker handled circa 5,000 pounds of dirty laundry a week, creating an identifying mark with a pen, small stitches or a pinned-on tag. Often, that marker's hands became covered by tiny pinpricks. One "safety" gesture recommended to laundry managers was the provision of open basins of water - into which had been dropped bichloride of mercury. Markers were to dip their hands in these basins every so often, ostensibly to protect their abrasions from infection. At the time, no-one understood mercury to be highly toxic. Yet markers had one of the higher turnover rates inside the laundry. A laundry's women workers labored in overheated rooms and fiery basements, operating heavy equipment, plunging their hands into water laced with soaps, caustic chemicals and the "bluing" needed to keep much washing white. Washers slopped their chemicals and boiling water onto floors and some women often worked standing in this, or on wet concrete. Few amenities were available to the laundry worker; there were few sanitary arrangements and rarely changing rooms. At Seattle Empire, there were just two tiny toilets - each of them located in the basement level. The shifts were long and tedious; machinery could be heavy and dangerous. 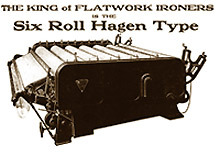 The mangle, a large mechanical ironing-machine for flatwork, required a team of six women to manage its hot, padded rollers. Heavy, wet laundry was also placed by women into extractors - huge drums which spun fabrics to remove the excess moisture. Those tightly intertwined goods produced by an extractor had to be shaken free by teenage girls: exhausting work always done standing on one's feet. Starch was mixed, then boiled up, in a kettle or a "starch cooker". It would be applied by hand to the finer items - which were then left isolated in the drying-room. Later, the garments or collars would be hand-ironed or pressed by machine then "hand-finished". At almost the same time Seattle Empire opened, the ten year-old local Supply Laundry added a 80' x 42' second story to its 119' x 160' premises. This entire area, noted Pacific Laundryman, was built to be a starch room, with "considerable new machinery of the latest design". The manager gave the magazine some daunting statistics: his girls handled "16,000 collars and 4,000 shirts" per week, requiring an army of delivery vehicles ("ten delivery autos, fourteen wagon and a boat on Lake Washington"). The yearly Directories of Washington Manufacturers indicate that Seattle Empire consistently employed as many or very nearly as many employees as Supply Laundry. Thus its laundry girls handled just as many collars and shirts. All large power laundries used specialized machines were to starch and iron collars, cuffs, gentlemans shirts and womens shirtwaists. At Seattle Empire Laundry, different tasks were on different floors: deliver, washing, and extracting took place in the basement and first floor; drying, starching and ironing took place on the second. The top floor was used for "storage"; it became a fully functioning part of the laundry only in 1923 (City Permit #227730). Most probably the sorting and marking first took place in the front basement area directly below the Will Call office. In May of 1923, sorting was moved to the second floor - a clothes chute was cut in the ceiling so marked goods could be easily transferred downstairs (City Permit #224818). Laundry workers were expected to finish all work before quitting. They got no holiday pay, no vacation and reports of health problems among them were continuous. In 1914, Caroline J. Gleason completed a report on women's work lives for the Industrial Welfare Commission. Her investigation, "On the Wages, Conditions of Work and Cost and Standards of Living of Women Wage Earners in Washington," concurred with grave concerns about conditions in the laundries. Nevertheless. laundry itself would simply not go away - and the power laundries were a fact of life in 1914. That year, the year D.C. Keeney opened his new Seattle Empire, the University of Washington launched its own "laundering course". An adjunct to the domestic science curriculum, its aim was to acquaint future housewives with power laundry technology. The 1914 instructor took her students on a guided tour of Seattle's busy Washington Laundry - which proved to be a sobering experience. "Like the majority of people who have patronized steam laundries year in and year out," reported Pacific Laundryman, "the visitors had but little conception what laundering consists of."